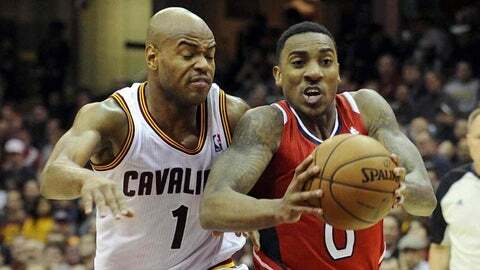 Cleveland, OH, USA; Atlanta Hawks point guard Jeff Teague (0) drives on Cleveland Cavaliers point guard Jarrett Jack (1) during the third quarter at Quicken Loans Arena. The Hawks beat the Cavaliers 127-125. 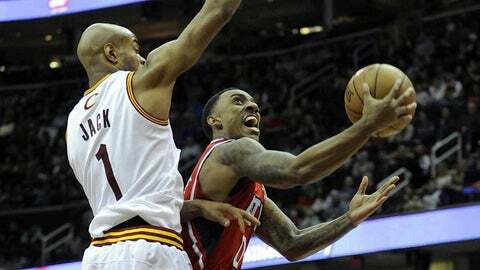 CLEVELAND (AP) — Jeff Teague scored a career-high 34 points, including a 20-foot jumper at the buzzer in the second overtime, to give the Atlanta Hawks a 127-125 win over the Cleveland Cavaliers on Thursday night. Teague’s fallaway jumper over Tristan Thompson bounced off the rim five times before falling through the net to give Atlanta the victory. Teague fell to the floor after shooting the ball and was mobbed by his teammates. Teague’s 3-pointer with 4.9 seconds left tied the game at 108-all in the first overtime. Kyrie Irving led Cleveland with 40 points, including 12 in the second OT. Hawks center Al Horford, who scored two baskets late in regulation to tie the game, suffered an apparent shoulder injury in the first OT and didn’t return. Irving hit a 3-pointer and a layup a steal for the first five points of the second overtime. Thompson followed with a basket and a three-point play to give Cleveland a 118-113 lead with 2:50 remaining, but the Hawks weren’t finished. Kyle Korver converted a four-point play with 2:33 remaining that cut the lead to one. Irving and Korver exchanged 3-pointers, Cleveland’s All-Star point guard followed with a jumper for a 123-120 lead. Following Shelvin Mack’s basket, Teague converted a three-point play to put Atlanta up 125-123. Irving’s jumper tied the game with 55.8 seconds left. Teague’s 3-pointer with 4.9 seconds left tied the game at 108-all in the first overtime. The Cavaliers called timeout, but Irving lost the ball out of bounds, giving the Hawks one last shot with 2.4 seconds to go. Teague missed from the corner, forcing the second overtime. Irving was held scoreless for the only time in his career when the teams played in Atlanta on Dec. 6. He bounced back from that game by hitting 17 of 33 from the field with nine assists in 45 minutes. Two baskets by Horford, who scored 25 points, late in the fourth quarter tied the game at 95-all and neither team scored again in regulation. Cleveland has lost four of five and three in a row. Korver scored 20 points, including four 3-pointers. He has made at least one 3-pointer in an NBA record 98 consecutive games. Cavaliers guard Dion Waiters returned after missing three games because of tendinitis in his right wrist. He scored 20 points in 41 minutes. The Hawks were coming off a 121-119 overtime loss in Miami on Monday. The defeat, in which the Hawks couldn’t hold a seven-point lead with 90 seconds left in regulation, broke a three-game winning streak. Cleveland center Andrew Bynum, who missed all 11 of his shots and was scoreless Monday against Detroit, had four points and one rebound in 17 minutes. He went to the bench early in the third quarter and didn’t return. NOTES: Irving has scored at least 20 points in seven consecutive home games … Cleveland coach Mike Brown moved F Earl Clark into the starting lineup in place of Alonzo Gee. Gee had started 15 straight games, but saw no action Thursday. … Hawks G John Jenkins (lower back pain) was inactive. … Atlanta F Cartier Martin (sprained left ankle) went through an extended workout after the morning shoot-around, but didn’t play.